Don Maximiano Errázuriz Valdivieso, who founded Viña Errázuriz in 1870, was a man of great vision and wide-ranging talents. Don Maximiano Errázuriz was born in Santiago in 1832, into a family of Spanish Basque origin settled in Chile since 1735. Over two and a half centuries, the family has played a significant role in the country’s cultural, social and political life. It produced two Presidents of the Republic, two Archbishops of Santiago and a considerable number of diplomats, writers and businessmen, who contributed to the development of the country. participated in public life as well, serving as a member of parliament for three terms, as a senator for nine years and as a diplomatic representative for Chile’s government, both in the United States and in the United Kingdom. Although Errázuriz was quite successful in business, he endured personal tragedies. His wife Amalia died in 1861 at the age of 24, shortly after having given birth to Rafael, their fourth child. To relieve his pain, Don Maximiano undertook a long journey through Europe. Upon his return, and following the example of his father-in-law, he planted vineyards in Panquehue, a small town north of Santiago. Unlike other families who had planted French grape varieties in the outskirts of the capital, he followed his pioneering instinct and settled in the Aconcagua Valley, where he founded Viña Errázuriz in 1870 under the premise “from the best land, the best wines”. 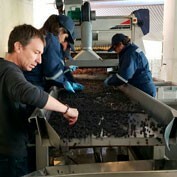 The 300 hectares planted in Panquehue soon began to be managed according to state of the art viticultaral techniques. Later, his son Rafael would enlarge the planted area to 700 hectares. According to contemporary information, this made Viña Errázuriz the largest winery in the world in the hands of a single owner. 1871 proved to be a crucial year for Don Maximiano: he met and married Carmen Valdés, started building a mansion surrounded by a beautiful park planned by a French landscape designer and embarked on another trip to Europe, this time with his wife. Unfortunately, on their return trip, Carmen contracted yellow fever. She died shortly after their return home surrounded by her family. In 1883, after their children became independent, Don Maximiano retired to Panquehue, where he lived an austere life, dedicated to prayer and helping the poor. He also built houses for his workers, a school and a church. He died in 1890, aged 58.